Customers have changed. They’re looking for new ways to engage with businesses. Consumers today have a new set of expectations. They want outcomes, not ownership. Customisation, not generalisation. Constant improvement, not planned obsolescence. The result? Businesses are changing the way they sell their products and services. Over the past 10 years, we’ve seen an explosion of new types of business models all designed to keep customers consistently engaged in long-term relationships—think Netflix, Amazon Prime, Uber, Spotify, Salesforce, Zendesk, Box. 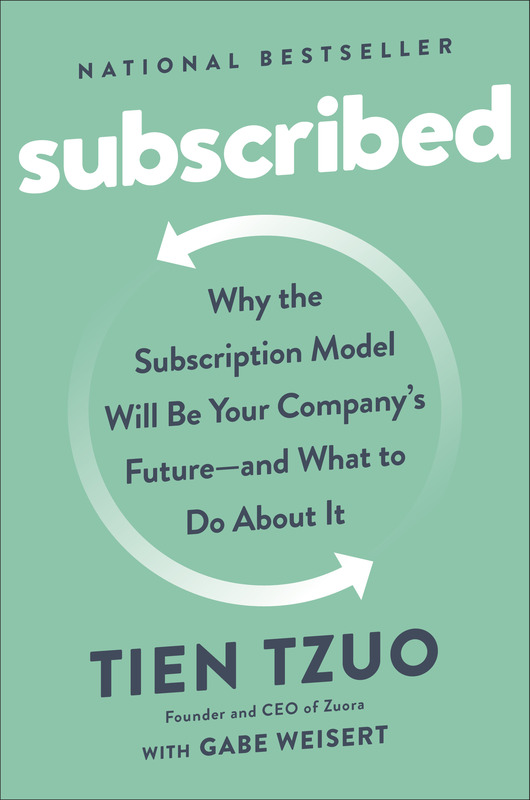 The Subscription Economy® is a phrase (coined by Zuora CEO, Tien Tzuo) to describe this new era of companies and business models. In the old world (the Product Economy) it was all about things. Acquiring new customers, shipping commodities, billing for one-time transactions. But in this new era, it’s all about relationships. More and more customers are becoming subscribers because subscription experiences built around services meet consumers’ needs better than the static offerings or a single product. Focusing on relationships requires a new way of thinking. Rather than placing your focus on the “product” or the “transaction,” Subscription Economy companies live and die by their ability to focus on the customer. The formula for growth lies in delivering multi-channel experiences and services (that get better over time). Join Zuora Founder, CEO and Author Tien Tzuo for this must attend keynote and hear how the leaders and innovators are liberating their businesses from the shackles of an old operational paradigm and driving the next wave of growth in the Global Subscription Economy. Simon-Kucher is the world’s leading pricing advisor; helping companies to grow profits by generating and extracting Topline Power, join them for this exclusive session you'll learn:. Leveraging data gleaned from his experience with over 8K recurring revenue businesses at Profitwell (formerly Price Intelligently), Profitwell Patrick Campbell will share data driven insights on the critical components of strategic subscription plans to help you harness value-and grow! Join Zuora's APAC Customer Success Manager, Natalie Kalas, as she hosts a fireside chat with local customers where they'll discuss the growth strategies that are essential to the survival and success of local high growth, digital businesses. From launch of a new product or service, to international expansion, massive growth of sales teams and pricing and packaging optimisation. Be prepared for a wide range of perspectives and a host impressive and inspiring local sucess stories. Our product team is constantly asking: “What can we build to help our customers grow even faster?” We’ve already built a leading portfolio of SaaS applications designed to help your business succeed in the Subscription Economy. And at last year’s Subscribed, we announced Zuora Central: a single platform for your order-to-cash process, and the connective tissue between your CRM and ERP. So what’s next? In this year’s product keynote, we'll launch the first ever order-to-revenue solution and show you how Zuora is powering the growth of 1000+ customers today. Join Zuora partner GoCardless at General Assembly for drinks and light refreshments. A short 3 minute walk from the conference venue, this is a chance to meet and network with the GoCardless and Zuora teams, as well as other local businesses succeeding in the Subscription Economy. About GoCardless: GoCardless makes it easy to accept recurring payments online. We unify the world’s Direct Debit networks, simplify them, and open up access to everyone. By doing so, we are creating an entirely new type of payment network. We work with a huge range of organizations: small gyms and scout groups use us to reduce admin, fast growing companies like Funding Circle use us to power their growth, and established institutions like the Financial Times use us to dramatically reduce failure rates. We are a small London based team, and we're backed by some of the world’s leading investors including Balderton Capital, Accel Partners, and Y Combinator. No sessions appear to meet your filter criteria. Please check back soon, or open up your search to find sessions.